PARIS (AP) — An on-form Stella McCartney presented her first Paris Fashion Week collection since taking full control of her eponymous design house this year by buying the 50 percent stake owned by luxury giant Kering. The British-American designer used her new independence to go back to her artistic roots on the runway Monday and spoke to The Associated Press about animal rights in the industry and fashion’s fledgling steps to go fur-free. Fluid silhouettes met sportswear, while loose knitwear was raw and deconstructed. Oversized “boyfriend blazers” were conceived in sustainable viscose and lightweight linen. The spring palette — washed-out neon colors and “dirty pastels” — felt as fresh as the funky soundtrack for the show inside Paris’ lofty opera house. So did the wallpaper florals on a swimwear-jumpsuit hybrid. 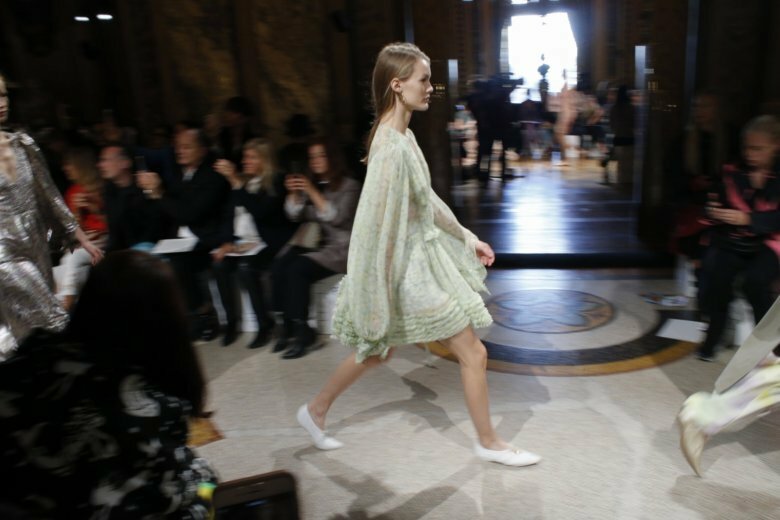 “The bold and the feminine … the quintessential … the classically Stella,” is how the house described the ready-to-wear show. But was reasserting her aesthetic identity a way to express her new-found financial independence? McCartney said “no,” —at least not intentionally. “There is this human instinct to put people down when they’re doing something good. Anything is better than nothing. It’s a positive thing,” McCartney told the AP. McCartney said she has seen a marked shift in the willingness of industry insiders to “have a conversation” about the ethics and economy of giving up materials from animals. “They didn’t when I started. I was ridiculed, really,” she said. Although Paris is far from going in London’s direction, McCartney sees hope elsewhere. McCartney’s late American mother, Linda McCartney, who died in 1998, was a prominent animal rights activist. To coincide with Paris Fashion Week, the year-old Yves Saint Laurent Museum is inaugurating a temporary exhibit devoted to the late French designer’s love for Asia. The show, “Yves Saint Laurent: Dreams of the Orient,” gathers from the museum’s archives some 50 haute couture looks inspired by India, China and Japan. The pieces are displayed with Asian art objects from the collection of the Guimet Museum of Asian Art, also located in Paris. The world’s largest continent featured prominently in the fashion designs and perfumes of Saint Laurent, who died in 2008. What do ponchos, tuxedos, floral gowns, men’s coats, tartans and sandals have in common? One of Japan’s most lucrative fashion houses, Sacai has built a reputation for the quirky. The first look set the collection’s ambitions high — a surreal tuxedo shirt in on-trend white that was snipped away surreally and deconstructed into its component parts. Its shirt pockets seemed to have melted down into a mis-shaped skirt in a brilliant touch of design skill. Elsewhere, a rifle green men’s coat was turned into an off-kilter poncho, with the model’s bangs swept to the side as if hit by a sudden gust of wind. An asymmetrical skirt with utilitarian eyelets looked also like it had been blown off course. Florals and decorative motifs — somewhat the signature for the Italian designer — were also a key feature but didn’t always hit the mark.